Toyohara Kunichika (1835-1900) Vendetta at Hikosan: Ichikawa Sadanji as Wada no Shimobe Busuke, 1873. Oban. 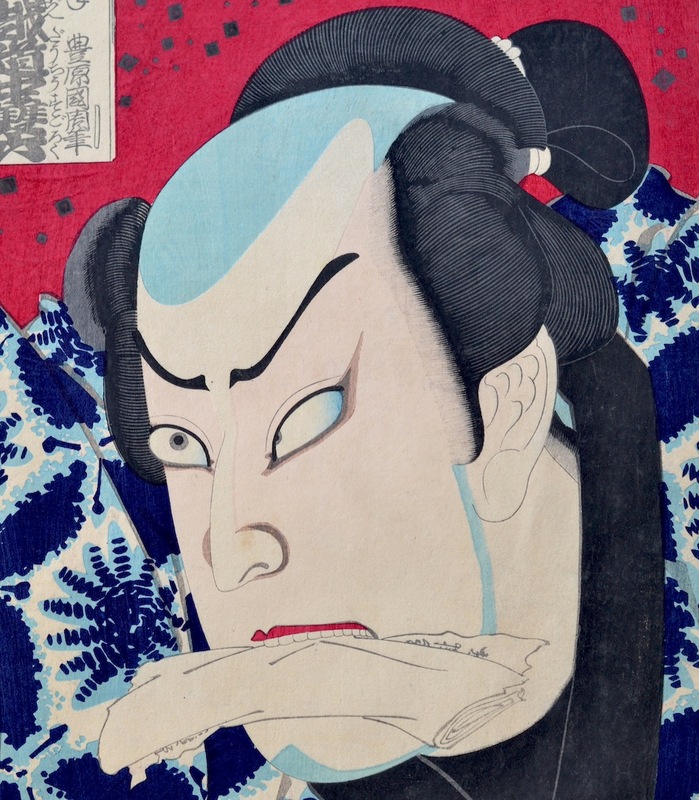 The finest and the most sought-after of Kunichika prints are probably the two great series of okubi-e (large head) actor portraits from 1869 and 1873. These are extraordinary designs and unprecedented in their boldness and abstraction. Surely deriving from the Osaka portrait in their brevity and design, there are few other comparable images in Edo ukiyo-e. Kunichika returned to this style only once more in a small series of okubi-e in 1894. 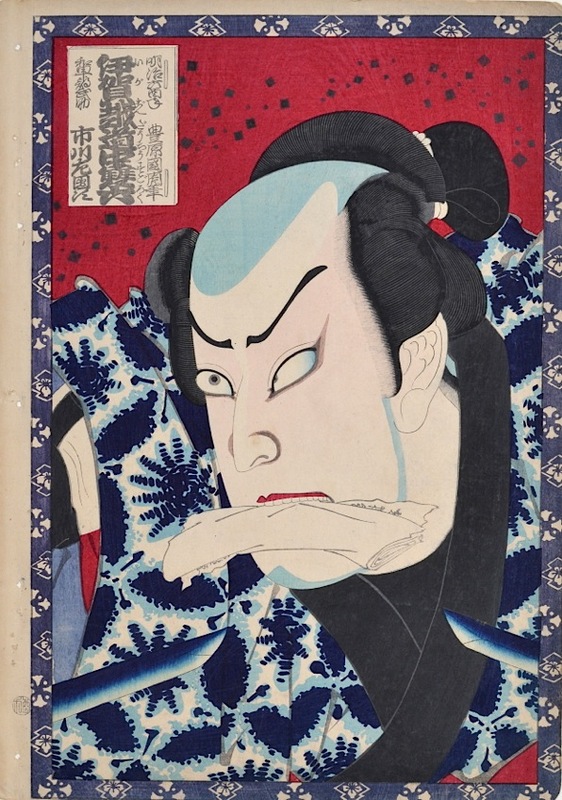 This series of 22 similar full head portraits depicts actors from hit kabuki plays, in this case the Vendetta at Hikosan. Kunichika draws the exaggerated, flattened heads of the actors so that they fill, and in places exceed the confines of the decorative border. The border itself illustrates the actor crests of the subject. This is a spectacularly good print. The grimacing face of Busuke clutching a scroll between his teeth looms out of the picture at us, his eyes in the familiar dramatic mie of the kabuki stage. The abstract mechanics of the features are a marvel. The sinuous, defiant brows seem anchored to the equally alarming eyes and lids, picked out in four separate shades. The economy of the drawing and the effect that it creates is extraordinary - it seems as if you could peel each device of the face and re-attach them in a different attitude. The print is perfectly in balance - the decorative background, with visible woodgrain in the red, the sharp points of swords to either side and starburst blues of the kimono anchor the portrait to the page. Sadanji’s crest and his alternative crest appear in the decorative border. The play (sometimes called Revenge at Igagoe), was popular among kabuki audiences and recounts the dramatic revenge by Wade Shimobe and his brother-in-law following the death of Shimobe’s father. A superb print, very fine and of the first edition. Impression colour and condition are exceptional. The print is illustrated full page, p105, in Newland, Time Past and Time Present: Images of a Forgotten Master, Hotei Publishing 1999.